Athens. ca. 393 to 300 BC. 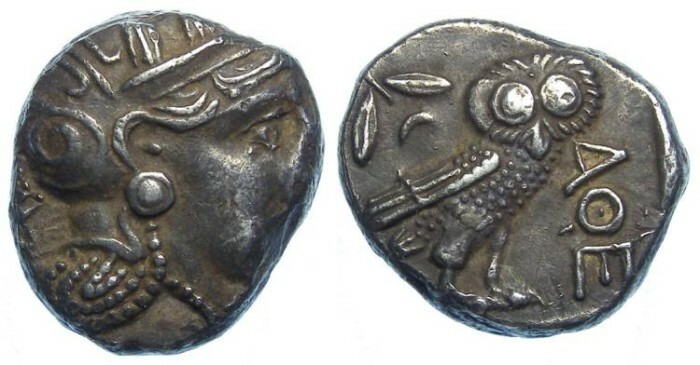 Tetradrachm. Date : The oval flan suggest a date somewhere around 350 BC or a little later. Size : 19.9 x 23.1 mm Weight : 16.97 grams. Grade : gVF but the obverse badly off-centre. Nice old toning. Reverse : Owl standing right, with an olive sprig and crescent moon over its shoulder, with AQE to the right. There is a very odd die flaw by the Q that makes it look almost like a Q.